When you are traveling with your laptop, you can make your e-mail more secure by omitting your password. At home or in your office, having Windows remember your Internet and e-mail passwords is handy — if your laptop is in a secure location or has adequate password protection. In Microsoft Mail or Outlook Express, choose Tools→Accounts. The Accounts dialog box reports for duty. In Microsoft Mail, click to select your e-mail account from the list; skip to Step 4. In Outlook Express, click the Mail tab. 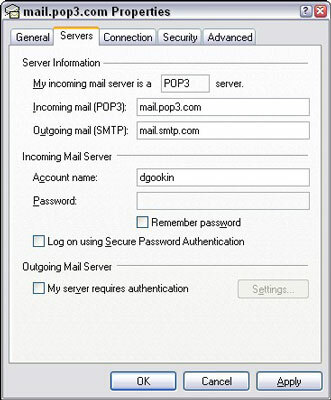 In Outlook Express, click to select your ISP’s mail server in the list. Your ISP’s e-mail connection Properties dialog box appears. Erase your password from the Password text box and deselect the Remember Password check box. Remove your password from the Internet e-mail account. Click the Close button to dismiss the various windows you’ve opened. You have to repeat these steps when you have more than one e-mail account listed; remove the password for each of them. Because you’ve removed your e-mail password, you’re prompted for it each time you go to pick up e-mail. A dialog box appears. Just enter your password, and then you can pick up your mail.